Lofts provide a unique living experience due to their architectural and functional features. They are usually constructed from converted factories, warehouses, gas stations, department stores, and other industrial and commercial buildings. Others are originally built as lofts by design. Construction finished with exposed concrete, brick, wood and steel beams, and other industrial materials. Large, open spaces allowing for flexible floorplans. High ceilings (10′ to 20′ or more) with exposed ductwork and electrical lines. Expansive windows allowing for lots of natural light. 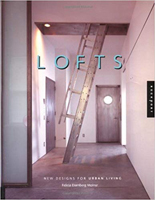 “Lofts features full-color photographs, plans, and a valuable resource guide for anyone who has every dreamed of converting a commercial building into a residential loft.” Published in 2001.